We have planted hundreds of thousands of seeds in the soil over the past two weeks. Most of them have germinated into healthy stands. 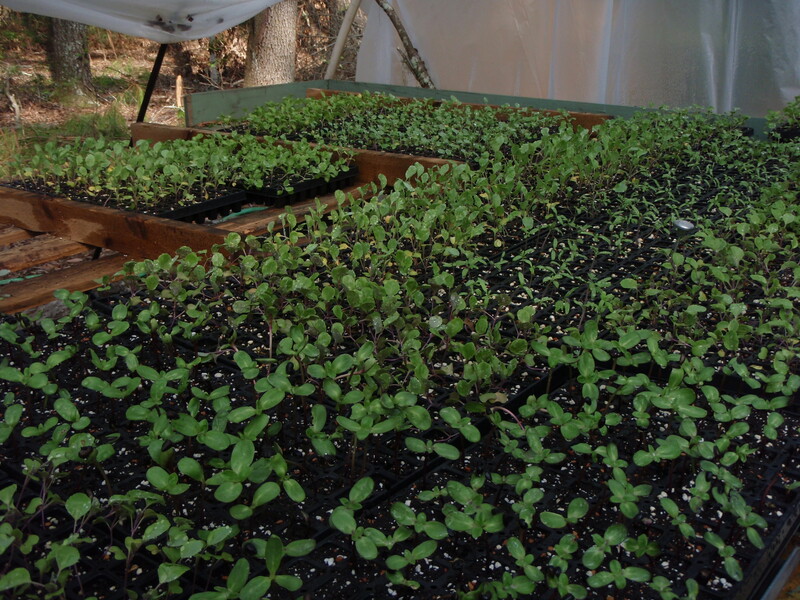 By mid-October we should begin the harvest with radish, arugula, chard, beet greens, lettuce mix, braising mix and thinnings of other vegetables. We harvested the first few arugula leaves today from a test plot and boy were they tasty! The most beautiful rain passed through our area a few days ago- the first chilly signs of Fall and a gentle soaking of the Earth. It came at the perfect time to give the sprouting seeds the boost they need to establish themselves. The deer made some advancements on the sunflowers and lettuce at the Swamp Farm. They were growing so nicely and the animals noticed! Lost most of that lettuce transplant and half the sunflowers. We added repellants on top of the deer fence. The top photo is at the Swamp Farm. 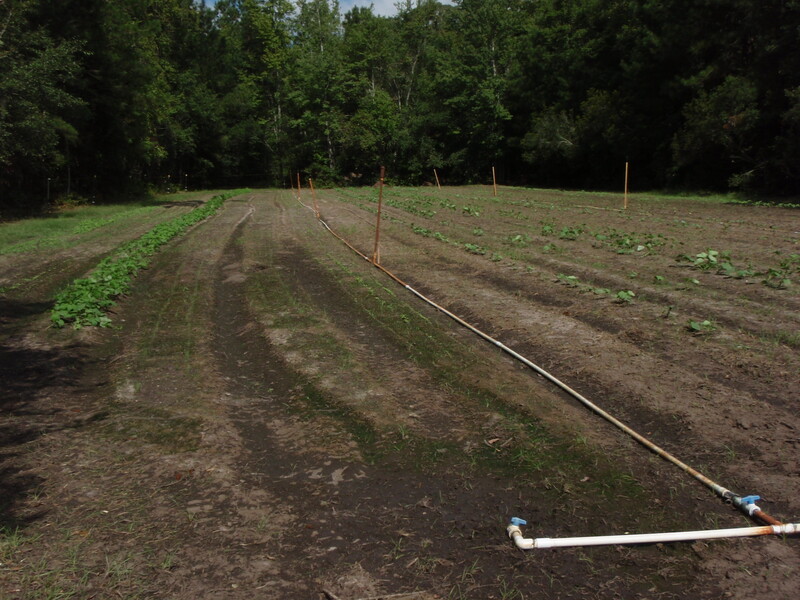 The beans are the tall plant on the left, to their right are the scallions and from then on arugula and 7 rows of squash and cukes, followed by the sunflowers and soem brassica transplants. We applied bt to the cucurbits as we saw worms eating and cocooning under the leaves. The bottom photo is at the Harts Bluff Farm. The beds are still beautiful after the rain and they are all planted with food! The left side has germinated completely except for the coriander. We are getting on the weeding asap. Riad is off in the leftern distance to provide you with some perspective. We are feeling good and await the harvests a’ plenty! I am realizing you can’t hope for too much perfection in this field of work. Just after beautiful beds are sculpted, three inches of rain dumps down in an evening. If all the work scheduled for that day had gotten done, our seeds would have washed away that night. Definite trade-offs. We need the rain, but we need nice beds. We work hard and long, but know when its quitting time too. Planting is moving along. The soil is really nice already over at the Harts Bluff Farm, so we don’t need to add too much compost. By the end of the week, we should have beans, red cabbage, carrots, lettuce, radish, arugula, a spicy braising mix, broccoli, cauliflower and beets in the ground. The soil is wet, the air is cool and the sun is shining- the perfect recipe for germination and transplantation. The torrential downpour gave the other farm a beating. So much water backing up in the fields. I don’t think it will need to be watered again this season! The squash and cukes have sand all over them and the beans fell over. These plants have a way of reviving themselves though. The sunflower transplants have added some new leaves and the scallions have all germinated. The chard and arugula are up too. Thank you to all of the CSA members, family members and friends who continue to support this project. It seems more impotant everyday to grow diverse crops, feed people and to teach others to do the same. Don’t ever hesitate to ask any questions from myself or on this blog. We were so lucky to have the tropical storm pass us by with little harm! Two inches of rain instead of seven saved the cucumbers and squash. We would have been under water otherwise! We are calling this the swamp farm, because it neighbors the swamp. Mosquitos constantly bite if there is not a breeze and it has very low elevation. We are trying a small plot for the Fall to see how it does. So far we have germination and not too many deer. The pH is low here, so we planted those crops which prefer the acidic side- squash, cukes, turnips, onions, mustard. We are attempting chard, sunflowers and arugula here too. This photo shows the raised beds which are mostly planted. The weeds are popping back up too. This field is enclosed by an electric deer fence. Here is the more promising field. The pH is a 6.8 and for the most part does not have too many obnoxious weeds. The elevation is higher and it has drainage ditches. 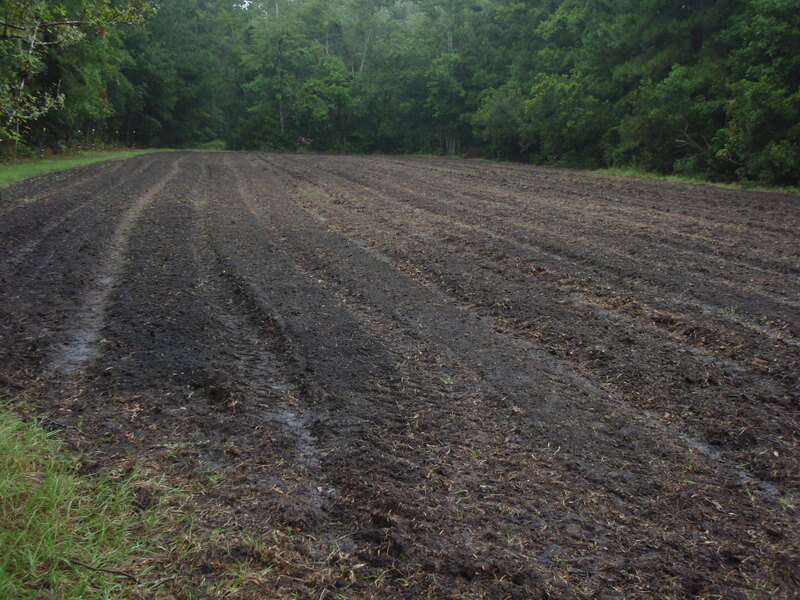 I plowed it for the second time today and by the end of next week it should be ready for planting. The transplants of cauliflower, broccoli, brussels sprouts, fennel and cabbage should be ready to go by then. It should also be cool enough to germinate beets, carrots, lettuce and other greens by then too. Note also our compost heap and hay mulch. Our concerns are never ending at the farm- wind, too much rain, too little rain, deer, bugs, disease, poor soil, lack of pollinators, mechanical breakdown and on and on. Some we can control and others we can not. Are we crazy for trying to make a living off of a job like this? I just keep thinking of how tasty those first Fall greens will be and it keeps me going. Happy Labor Day, Everyone! The fields have finally dried up enough for us to get the tractor in to disc, rake and shape our beds. And does it look beautiful! 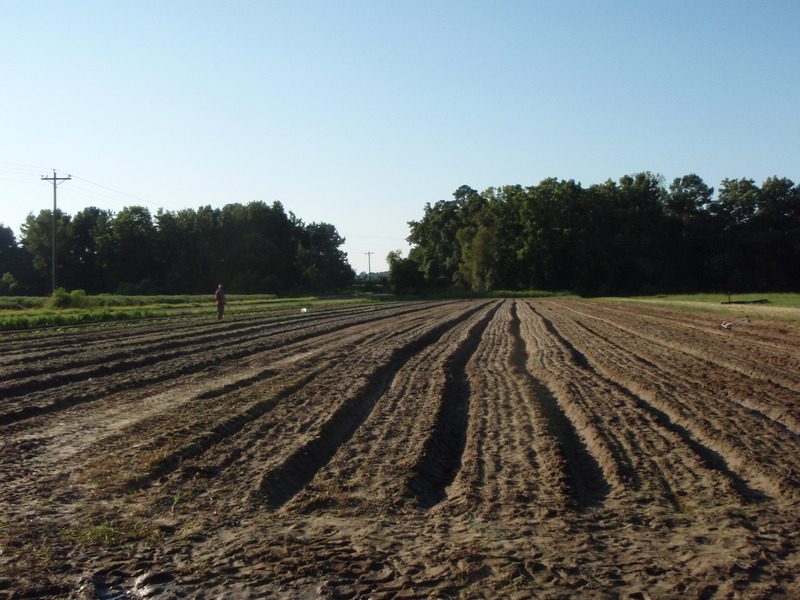 So far we have planted 500 cucumber plants, 175 summer squash and 250 green zucchini, and 175 Delicata winter squash. A light rain came just after planting to water the seeds into the soil. Tomorrow we should be rolling right along with butternut and acorn winter squash, bush beans, turnips, scallions, radishes, and a braising mix. There is more rain coming this weekend with the tropical storm headed our way. We are trying to get the big seeds and quick germ inators into the ground before that happens! Here is a shot of the inhabitants in the greenhouse. Here we have brussels sprouts, cabbage, broccoli, cauliflower, fennel and sunflowers. Right now the fennel are stemmy and wimpy. I am hoping they become thicker skinned before transplanting. Probably another two weeks before that. Most of these babies will go over at the other farm on Hart’s Bluff. The pH is just right for them there. 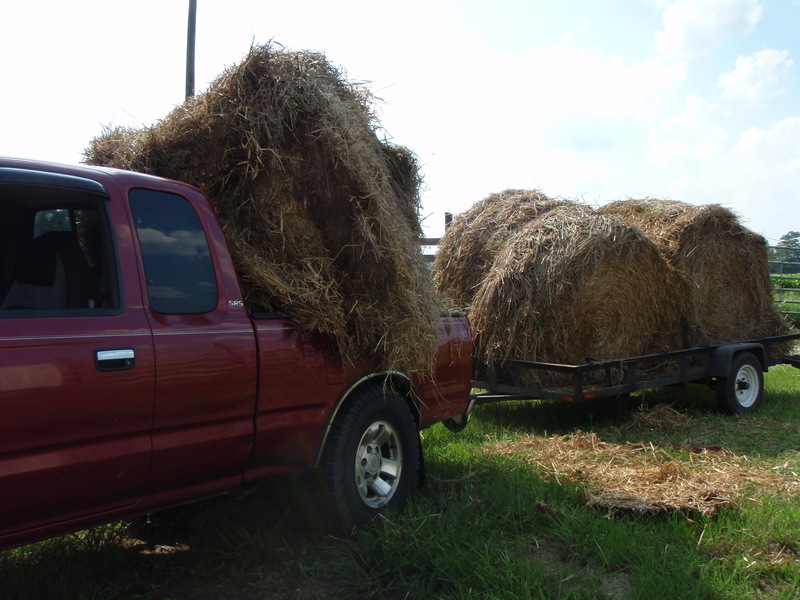 Earlier this week we drove to Canadys, South Carolina, along the Edisto River to pick up some wheat straw round bales to use as our mulch. Beautiful drive and nice folks along the way. After spending hours and hours pulling up the black plastic mulch at Hart’s Bluff, we have decided not to use that stuff if we can avoid it. What a mess it makes in the field. So much waste and cleanup. 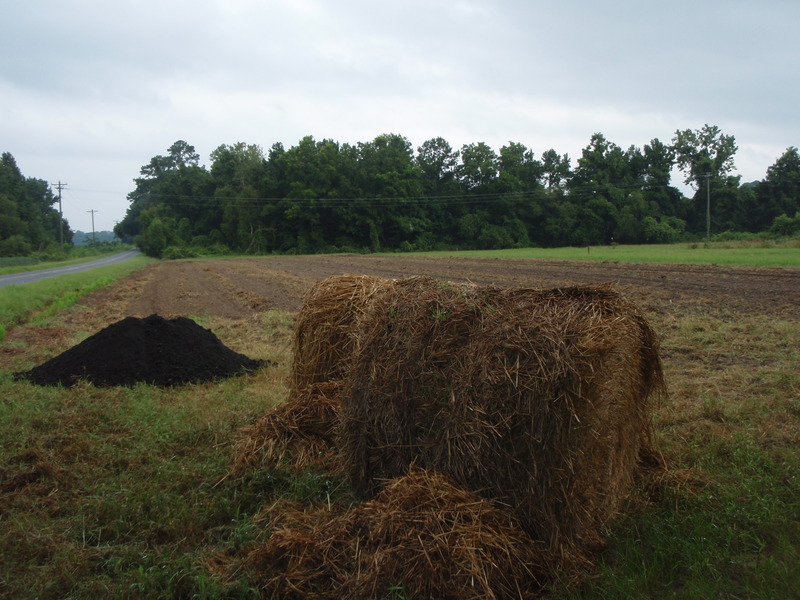 Instead we have opted for the straw, which we can turn into the soil at the end of the season to add more organic matter. Our truck was loaded down! Please pray for not too much rain this weekend. If we get washed out, we will just try again!